October 17, 2011 - Chanhassen, MN - In an effort to further differentiate itself as the leading company in the CD/DVD Duplication and Publishing market, Microboards has strengthened its customer service team with the addition of three people to support the efforts of its value-added reseller (VAR) customers and inside sales team. 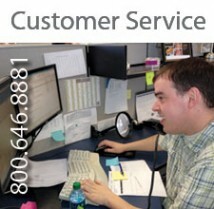 “Microboards has always been a best-practices company in terms of customer service. With this expansion we have formalized that in to a separate department, to ensure that every transaction and interaction with our customers is the best it can possibly be”, said Dean Ditty, Director of Operations. The team, led by Microboards veteran Andy Broderick, will oversee all aspects of order processing and provide a first point of contact for shipping and pricing issues. “Not only will this create a single point of accountability for our customers, it will also ensure quick response from a team that is dedicated to these critical tasks”, says Ditty. Mr. Broderick is assisted by two data entry people, who double check every transaction for accuracy. The structure is designed to provide redundancy and speed without sacrificing accuracy. new business development, it will make our operations more efficient, and it will help provide more meaningful data that we can use to make long-term business decisions. Resellers and their customers will continue to have dedicated sales support through the team of experienced account managers, but will also now have access through Mr. Broderick to instant answers and assistance with ordering, shipping, and pricing issues. Andy Broderick and the service team can be contacted by calling toll-free 800-646-8881 and selecting option 1, or by e-mailing the new orders@microboards.com e-mail. Microboards ignited the industrial disc duplication revolution in the 1990s with the CopyWriter Tower and continued its tradition of leadership with the first DVD Duplicators and other award-winning products. Today, Microboards continues to lead the industry in innovation with its award-winning automated publishers and industrial disc printers.